COULD TEMPRANILLO BE OUR NEXT BOOM WINE? A FEW years ago Tempranillo was little known in Australia, but in just the last few years plantings of the vine have doubled and indications are that they'll double again – not in a few years, but in just the next one or two as we really take to it. Spain's most famous wine, Tempranillo is an easy drinking red that goes well with warm-weather outdoor dining, so now is the time to start thinking about it for the coming months. The Clare Valley's Tim Adams and his wife Pam Goldsack are amongst our greatest enthusiasts of the variety, Tim pointing out the similarity in climate between the variety's homeland in Rioja and La Mancha, and the Clare. "They're all Mediterranean in climate, with hot, dry summers and cool-to-cold winters," he says. "And like Rioja and La Mancha, Clare is continental rather than maritime, and we are similarly around 500 metres in elevation." worth considering for a few in the cellar. His Tim Adams Mr Mick label Tempranillo is an easy-drinking style with juicy, rich cherry, plum and strawberry fruit flavours and a nice velvety finish. At just $15 it's a great-value drop too, especially to pair with (naturally) a Spanish seafood paella outdoors on a sunny day, or with simple ham croquettes. ONE TO NOTE: THIRTY year old Hunter Valley vines gave Andrew Margan marvellous fruit for his 2012 White Label Chardonnay, and by picking that fruit while still at lower sugar levels it's given the resultant wines leaner structure and nice citrus overtones. This is a wine that's all about lovely forward stone-fruit flavours with those citrus overtones and a flint-like complexity to it. Certainly one to enjoy now with barbecued Tasmanian salmon or barbecued pork chops with an apple compote. And at $35 and showing all the signs of maturing nicely over the next five years, it wouldn't be a bad idea to enjoy a bottle now and put a couple away to enjoy with a bit more maturity to them around 2017/18 – when doubtless you won't find it on the shelves, and even if you did it would certainly be a lot more than the current $35. NEED A FOOD/DRINK IDEA? Check out http://www.vintnews.com We're also on Australian Good Food Guide http://www.agfg.com.au in main blog. 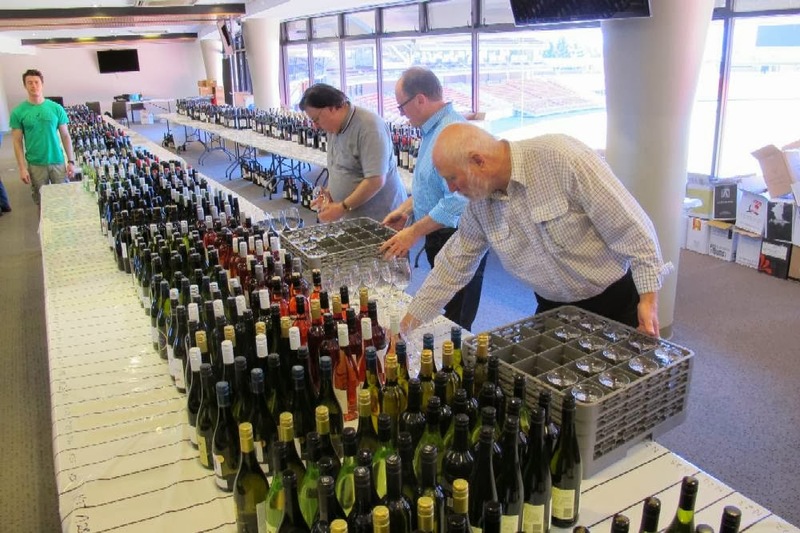 Fake judges exposed at NSW Wine Show. Blogger confesses. Today I penetrated the hallowed realms of the wine judge, masquerading for a moment, as an arbiter of life or death in the wine industry. Fortunately for the industry, I was discovered before I could do any damage, but not before I learned a few secrets of the trade. At the forthcoming Citibank New South Wales Wine Awards, varieties from all 14 wine regions of NSW are represented. In 2012, 676 wines were entered and 311 medals awarded including 36 Gold, 75 Silver and 200 Bronze. This year I’m told, there are more exhibitors, but less wines. Either way, it’s a good sign for NSW wine. My lesson in wine judging came at the hands of NSW Wine president, Tom Ward, and promotional head, Alex Retlief. 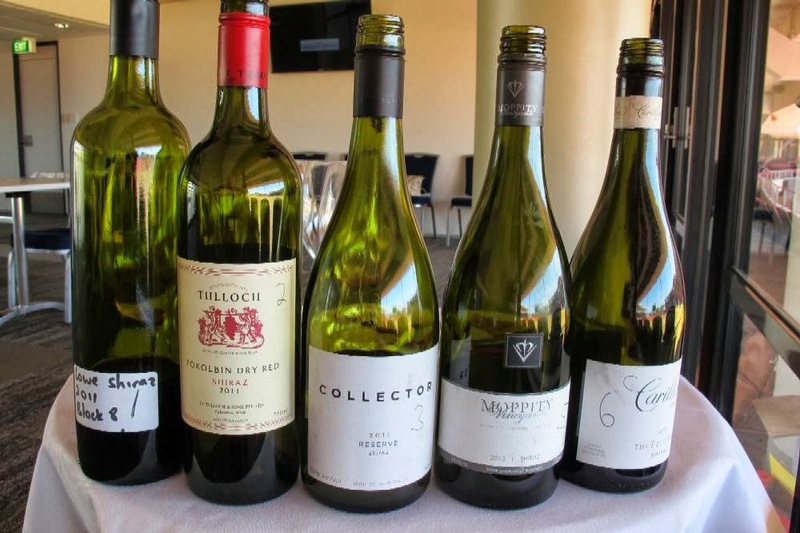 We (yes, I was aided and abetted in this deception) were presented with a selection of six Semillon and six Shiraz bottles which we judged according to standard rules. Now, you might say, ‘down the hatch’ is as good a test as any, but in this auspicious company, I had to make some effort at decorum. Next to me was Paul Gardner, the new sommelier at the revamped Park Hyatt Sydney, so I was getting plenty of sideways glances. I bumbled through the six Semillons first, with scores wildly off target. I’m not a seasoned Semillon drinker, so I was a bit (okay, a lot) out of my depth. With the Shiraz, however, I was much closer to the mark. I can trace my family line back to the first Barossa settlers, so I should have some inkling at this varietal. For those who’ve never judged in formal sense, there are three things to take into account: 1) colour, 2) nose, and 3) palate. In other words, sight, smell and taste. Each is weighted 3, 7 and 10 for a total of 20 possible points. 18.5 will get you a gold, 17 a silver and 15.5 will scrape in for a bronze. Interestingly, I found my scores much closer to Alex’s, while Tom’s varied wildly. In one case, a wine (unnamed, sorry) received 17.5 from Alex and I, while took a flogging from Tom at 13. Forget about me for a minute, how can two experienced palates come to such a variance*. Chairman of judges, and doyen of the wine industry, Huon Hooke, explains. while Huon Hooke adjudicates. Who will back down? I feel much better. The chairman of judges has reinforced the common person’s view (ie mine) that you either like a wine, or you don’t. There is no right or wrong. It’s common, I’m told, for oft-scorned supermarket labels to rate surprisingly highly against icon wines in blind testing. Especially by consumers, who are the ones, let’s remember, who fund the wine industry. So, dear readers, do not feel put out if you disagree with your dinner guests about any particular wine, because I have it on good authority now, that even the best can have seriously split opinions. For the sake of interest only, here is my judging of the Shiraz offered. The awards are divided into 16 categories: Best Young Chardonnay, Semillon, Riesling, Sauvignon Blanc, Other single varietals, White Blends, Best Young Shiraz, Cabernet Sauvignon, Pinot Noir, Other single red varietals, and Red blends as well as the Mature Dry Red and Dry White trophies, Sparkling and Sweet wines. The New South Wales Wine of the Year is chosen from one of these categories. There is also an award for the Best Organic Wine of Show. You can be a fake judge too. Or for real, if you like. Taste the top NSW wines for yourself. * the wine in question actually contained fault. Brettanomyces (or just Brett ) is a wild or 'feral' yeast compound that can alter the bouquet and palate of a wine. In small quantities it can be favourable, but when it overcomes the natural flavours it can be overwhelming with a so-called 'barnyard' 'hospital' or 'band-aid' aroma. brunch of bacon stuffed mushrooms. WHEN you are growing vines on land whose characteristics can best be summed up as austere, and with its harshest areas almost pure rock, you can expect crops to be pretty minimal. Such is the case with the St Mary's Vineyard that the Mulligan family planted to vines outside the township of Penola in South Australia's south-east back in 1985 – even though Mulligans have lived on the land there for over 100 years. But what this vineyard may lack in large quantities of fruit, it has sufficient of the region's famed Terra Rosa soil over a limestone sub-base to make up for in fruit quality, and with a just-released 2012 St Mary's Pinot Noir proving a surprising gem for those of us who enjoy this lovely food-friendly red. seafood or pork – and a nice price too. ONE TO NOTE: STILL in South Australia, Howard Vineyard near Nairne in the Adelaide Hills and just 25km from the Adelaide CBD, has a delightful 2013 Clover Pinot Gris from a region that produces some of Australia's best examples of this varietal. Situated some 450m above sea level, their Schoenthal vineyard enjoys a long, cold ripening period that's perfect for acid development and fruit intensity. With a nice citrus zing and crisp acidity this is a lovely food wine: match it nicely chilled with seafood or pork dishes and you'll find it wonderfully rewarding. marriage with tomato-based Italian dishes. 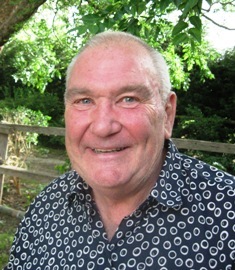 PETER Logan is a passionate Aussie, and the more-so when it comes to the product of our own home-grown wineries, because as he says, "with some of the most interesting, excellent value, and even quirkiest wines around, why go looking abroad for something to stand out from the crowd?" His own Logan label made from fruit from Mudgee and Orange in the Central Ranges of NSW provides great examples of what he is talking about. A 2011 Logan Weemala Merlot, for instance, at just $18 is a wonderfully quaffable drop with all the necessities to team-up with a whole range of food choices – especially tomato based Italian dishes. This 2011 Logan Weemala Merlot brims with forward plum, mixed berries and thyme flavours and has an enjoyably long finish. At $18 match it with your favourite Italian dishes, or individual-serve Mediterranean herbed chicken en papillote. ONE TO NOTE: ANDREW Margan has crafted a ripper drop from fruit off 70 year old Hunter Valley dryland vines for his 2011 Margan White Label Semillon, a wine that's a power-house of wonderful fruit flavour and which, having been made in the traditional low-sugar manner, will ensure rewarding cellaring and development over the next 10-20 years. Worth the $35 asking price for enjoyment now with a whole range of chicken, pork, fish or shellfish dishes, this is a Semillon with crisp citrus characters on the nose that follow through beautifully on the palate, which in turn is balanced, crisp and clean. Time in the cellar will see excellent intensification of these fruit characters as this wine matures in typical Hunter Semillon style – so maybe it's worth investing in a bottle for now, and one (or two) for down the track? Experience the best the Hunter Valley has to offer in one day and in one place, at Crowne Plaza Hunter Valley, for the inaugural Hunter Valley Wine Festival on October 12, 2013. The event will bring together more than 30 local wineries and producers for a day of tastings, gourmet food and entertainment, surrounded by picturesque vineyards and the rugged Brokenback Ranges. A range of Hunter Valley's finest producers will treat festivalgoers' tastebuds, from boutique family-owned wineries to more established operations such as Tyrrell's Wines, Brokenwood and Peterson House. Local boutique beers and crisp ciders will also be on offer, complemented by gourmet fresh produce from the region. The festival which will be held on the hotel's sprawling grassy lawns and in the stately new marquee will also be alive with entertainment throughout the day, including guest speakers, live music and a program of family-friendly activities such as face-painting, a jumping castle and train rides. With everything in one place, festivalgoers can relax and enjoy the day at their own pace, between 11:00am-5:00pm. For the ultimate wine festival experience, stay on-site in a deluxe room or self-contained two- or three-bedroom villa at Crowne Plaza Hunter Valley. Hotel guests can break from the festival any time to enjoy the range of facilities around the grounds, including an 18-hole golf course, day spa, outdoor pool, tennis and basketball courts, oversized chess set, two restaurants and two bars -including Vista Lounge, renowned for having one of Australia's largest whisky collections. The hotel also offers the only complimentary fully supervised kids' club of any hotel in the region, the Water Dragons Kids Club for children aged three to 12. 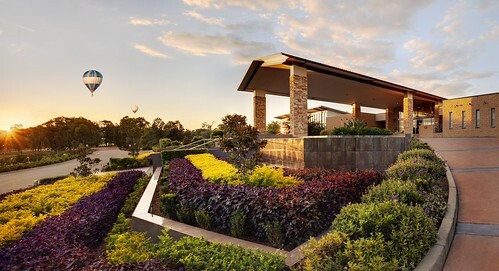 Crowne Plaza Hunter Valley is offering a special Hunter Valley Wine Festival package, including two-night stay, breakfast for two and festival tickets for two, starting from $450 per night for a deluxe room*. For more information or to make a booking, visit www.huntervalleywinefestival.com or call the hotel on (02) 4991 0970. The Hunter Valley Wine Festival is an initiative of the Schwartz Family Company, owners of Crowne Plaza Hunter Valley and event organisers of other successful festivals in NSW, including the popular Canberra Craft Beer & Cider Festival, held since 2008, the Brew Mountains Beer Festival and Newcastle Beer Festival. "I'm passionate about the Hunter Valley, that's why I bought the hotel and we've just purchased the adjacent McWilliams Middle Creek vineyard, which has 35-year-old chardonnay and semillon vines that have produced some of Australia's most distinctive wines," said Dr Jerry Schwartz. "This festival is a celebration of what makes the Hunter Valley so attractive. We will showcase the region's best wine and food, and importantly, we will have entertainment and attractions for all the family. I want this resort to become one of Australia's most family-friendly resorts." Tickets to the festival are $30 pre-sale and $40 on the day (if available), and include 10 free tastings. Children under 18 years of age are free. For more information, or to book tickets, visit www.huntervalleywinefestival.com. *Minimum 2 nights stay. Terms and conditions apply and are subject to availability. The 2013 Riverina Wine Show results have just been announced and highlight the fantastic diversity and depth of quality in Australian wine with 9 different regions taking home the 11 individual "varietal/style" Trophies awarded this year. Only Coonawarra and Rutherglen doubling up to secure two Trophies each. International Guest Judge Madeleine Stenwreth MW commented, "The highlights in the competition were truly great examples of Australia's diverse regions at their best expression. I was especially impressed with the classiness of the awarded Cabernet Sauvignon, the purity, elegance and restraint of cool climate styles of Chardonnay, the 2013 Semillons as well as the aged beauties of this unique variety". When it came to the "Best of…" Trophies, there were some familiar faces in the crowd at this weekend's Awards Presentation, as some of the previous year's finalists returned for a re-match to see who would win the hotly contested title of 'Best Still Wine of Show'. Last year, Brand's Laira's 171 Cabernet Sauvignon (2009 vintage) narrowly missed out to Zeppelin's Amelie Shiraz to be named 'Best Dry Red', which in turn was beaten to the 'Best Still Wine of Show' Trophy by the 'Best Dry White', the Echelon Wine Partners' Armchair Critic Chardonnay (2010 vintage). However this year was the year for Cabernet to shine again with the 2010 vintage of the Brand's Laira's 171 Cabernet Sauvignon collecting the title of 'Best Dry Red' and then being selected over the new 'Best Dry White', the 2012 vintage of the Echelon Wine Partners' Armchair Critic Chardonnay, to be crowned the top 'Best Still Wine of Show'. Jim Brayne, Chief Operating Officer at McWilliam's Wines and Brand's Laira representative said, "We are thrilled that the consistent quality of our wines has been recognised by the judges at the Riverina Wine Show and also that our newest vintage has excelled at this competition. This is a fantastic follow on to the multi award winning 2009 vintage Cabernet. 2010 was an outstanding vintage for us in the Coonawarra and has enabled us to produce Cabernet's which we believe are world class as well as amongst the best in Australia." The other highly anticipated category of 'Best Popular Premium wine' saw a Trophy awarded to Jacob's Creek St Hugo Shiraz Cabernet 2010. The Riverina Wine Show is unique in its aim to specifically recognise the quality of "Popular Premium" wines - those wines which are widely available to the general public, with production runs of at least 60,000 bottles. As Chair of Judges Ben Edwards (co-contributor to James Halliday's Wine Companion and President of Sommeliers Australia) puts it, "Trophies that highlight to the consumer that big can be beautiful!" Well known local winery De Bortoli Wines not only collected the Best Shiraz Trophy for their 2012 Windy Peak Shiraz but were also awarded the title of overall 'Most Successful Exhibitor' flying the flag for local producers at the show. Judging was held at Woodside Hall, Griffith Showgrounds on 27,28th August and the winners were announced at the Awards Presentation luncheon on Saturday 7th September in conjunction with the Griffith Jockey Clubs race day. NEW ZEALAND'S Giesen Wines, who've been in the business some thirty years, have just released their first-ever organic wine, and appropriately in the footsteps of their flagship Sauvignon Blanc. Fruit for this quite marvellous drop came off vines planted in 2010 on a vineyard that had been left fallow for two vintages, after earlier vines had been ripped out; Giesen now have around 40ha of their 290ha vineyards at Marlborough planted to several varieties of vines that are raised and cared for organically – something that winemaker Marcel Giesen says "spurs the viticultural and winemaking teams to become much closer to the seasons and the vineyards. "Now when it rains they have to get back into the vineyard to see the impact," he says. "They can no longer rely upon having the backup of additives to protect the fruit. By returning to traditional practices, we are growing grapes true to reflection of the terroir." Fruit for the Giesen Organic Marlborough Sauvignon Blanc 2011 came from two distinctly different vineyards, giving a wide range of fruit flavours that are reflected in this wine's crisp, zesty citrus flavours and herbaceous notes. Pay $19.99 for this interesting, rewarding and ideal seafood wine: pair it with pan-fried trout or grilled lobster, or a cold seafood platter. ONE TO NOTE: MANDALA Wines owner, Charles Smedley was quick to recognise the good vintage shaping-up in the Yarra Valley in 2010, but confesses now that he didn't realise just how good. "The warm to mild conditions gave us a long, gentle growing season, and the rains came in an even cycle so there was no need to irrigate," he says. The resultant Mandala 2010 'The Butterfly' Cabernet Sauvignon reflects that vintage, with Charles saying that seeing the wine now after time in bottle, reflects how the vintage was "better than just good – it was particularly good." At $50 this is a roast dinner wine to enjoy with anything from beef or lamb, to duck or wild game. GOING organic keeps New Zealand's Giesen Wines' crew of their toes – but rewards with drops like this. PARTICULARLY good vintage brought about this great roast dinner wine. It may not be the hippest wine region in the country, but its hard to beat the Riverina when it comes to value. What do wine buffs, surfers and the discerning Perth weekend crowd have in common? Largely their love of their own pristine backyard, the south- west region of Western Australia, stretching through wine country and tall forests all the way to Albany, with magical things to see and do along the way. But now the rest of the world is waking up to the area, curious to see what all the fuss is about. For a start it makes sense to fly into Perth from Europe and Asia as the flight times from London, Frankfurt and Amsterdam are under 18 hours and just under 5 hours from Singapore. From here you can explore Perth and travel south to explore the fabulous coastline, the Margaret River Wine Region and beyond. Perth is the world’s most isolated capital city, but don’t let that worry you as both it and Fremantle offer superb food and wine, arts and cultural activities to soak up before heading south. Driving in the area is a pleasure and it is no wonder that car companies often use the area as a launch and test-drive location. It’s a three-hour drive to the famous Margaret River Wine Region and you can take it easy stopping at places along the way. White beaches, sweeping bays, cliffs and oceans that vary from stunning blue to deep green – you’ll be amazed at the scenery and sheer freshness of it all. Your journey need not be direct and you’ll love turning off to explore as you wish. Drop in to Bunbury, the City of Three Waters, with the surf of the Indian Ocean, the Leschenault Inlet and Koombanna Bay on three sides. More than 100 bottlenose dolphins live in Koombanna Bay and you can swim with them and cruise alongside them from the Dolphin Discovery Centre. Busselton is in a fantastic setting on shores of Geographe Bay – the water is usually a fabulous blue and more than 30 kilometres of dazzling, white sandy beaches stretch off into the distance towards Cape Naturaliste. You can snorkel, dive, fish and sail, cycle the foreshore or just sit in a cafe or bar and watch the world go by. If you’d like to see the underwater world without getting wet, the Busselton Jetty’s Underwater Observatory is 12 metres below the surface on the ocean floor with 11 viewing windows through which to see the vivid corals and marine life of the jetty’s own reef. Just before Cape Naturalise, Dunsborough is a place where the vineyards meet the sea. Discover Bunker Bay and Meelup Beach, photograph Sugarloaf Rock and dive the 113-metre Swan Dive Wreck. Around Margaret River and Yallingup catch (or maybe just watch) the waves at Surfer’s Point where the Margaret River Pro is held or Smiths Beach for fishing, swimming and surfing. The Yallingup Surfilm Festival is held every two years and the next is in January 2012, featuring surf films, surf book authors and all sorts of surf legends and culture. Surfing’s not the only thrill – the area is famous for its caves and Outdoor Discoveries run caving programs from large caverns to, as they put it, tight squeezes! They will also take you abseiling and rock-climbing at the Willyabrup sea cliffs, one of the South West’s premier sites. Don’t forget to drop in to the Kodja Place Visitor and Interpretive Centre in Kojonup, and the Wardan Aboriginal Cultural Centre in Yallingup to discover more about Indigenous history and culture. In Margaret River wine country there’s fabulous food and local produce to complement the wine trail. The region is responsible for over 15 per cent of the country’s premium wine and the cellar doors and restaurants echo the quality. The Margaret River region sits on an ancient granite peninsula between Cape Naturaliste and Cape Leeuwin along a coastal ridge enjoying fine soil and a maritime climate that produces fine Cabernet Sauvignon, powerful Shiraz and intense Chardonnay among its different varietals. Labels such as Cape Mentelle, Vasse Felix, Cullen, Fermoy Estate, Xanadu, Howard Park and Madfish are just a handful of examples of the wine labels of the area. Madfish is part of Howard Park a family owned company with a cellar door in Margaret River and also at Denmark in the Great Southern wine region around the coastline near Albany. Great Southern is a lesser known but much larger region, 100 kilometres by 150 kilometres and with five sub-regions, Denmark, Albany, Mount Barker, Frankland River and Porongurups each with its own variation in climate, making this a fascinating wine region to tour. Howard Park has grown into Western Australia’s largest family-owned wine company under the guiding hands of Jeff and Amy Burch their multi-award winning Howard Park Riesling and Cabernet Sauvignon testament to the diverse growing conditions of the area. South east of Margaret River, Pemberton continues the foodie theme with specialities such as black truffles grown at Manjimup. Visit the Wine & Truffle Co and join a ‘truffle hunt’ to locate the wonderful black truffles beginning in April each year. Alongside vineyards and pastures, Pemberton is surrounded by spectacular karri forests of the Gloucester National Park. The Gloucester Tree is WA’s most famous karri at 61 metres tall and you can visit cafes and vineyards and bushwalk along the Bibbulmun Track through the forest. If you don’t want to walk you can also see the forest by tram or steam train. You’ll also see karris between Manjimup and Denmark and in spring the forest floors are covered with wildflowers. The Tuart Forest National Park along the Swan Coastal Plain between Busselton and Jurien Bay protects one of the most precious and rare ecosystems on earth with tall grey-barked tuart trees and endangered wildlife such as Carnaby’s black cockatoo. Further south, Denmark on the Denmark River has turquoise Ocean, spectacular beaches, whale watching, cellar doors and enticing berry farms and toffee and cheese factories. The area is also known for wildflowers and walks – the Tree Top Walk in the Valley of the Giants is a walk through the canopy of a forest of gigantic tingle trees nearly 40 metres up in the air in the Walpole-Nornalup National Park. The buttressed red tingles can reach 75 metres in height and 26 metres at the base, the largest of any eucalypt. Margaret River’s Cape Lodge is WA’s best known boutique hotel and check out the Injidup Spa Retreat, Smiths Beach Resort south of Yallingup and Pembertons’ Stone Barn to name just a few of the places to stay. Also note that bike riders can cycle the Cape to Cape track and the Munda Biddi Trail and, from March 2011, Auswalk is launching a self-guided nine-day, inn-to-inn Cape to Cape walk. Written by Alison Plummer on behalf of Tourism Australia. FIANO is a very popular white in the Mediterranean, hailing from Italy's southern Campania region as well as from the island of Sicily, and is now starting to get the attention of grape-growers and winemakers here – and with consumers, too, discovering it's enjoyably vibrant and bright fruit flavours and rich palate. One local maker with a Fiano worth seeking out is McLaren Vale's Serafino Wines, that was founded by Steve (Serafino) Maglieri in 1968, and who's now-Chief Winemaker, Charles Whish is a Jimmy Watson Trophy recipient. Their 2013 Serafino Bellissimo Fiano bursts with citrus and stone fruit aromas, and is crisp and refreshing in the mouth, offering nice hints of honeysuckle and lemon citrus. Made from fruit handpicked from Serafino's first Fiano crop, it's sure to instantly appeal to those who enjoy broadening their wine-tasting experiences. Particularly enjoyable with seafoods, at $18 match it as we go into our warmer months with whole oven-baked fish such as snapper, a fresh garden salad and garlic bread – just as they do back in its Mediterranean homeland. ONE TO NOTE: WESTERN Australia's Ferngrove has launched a new-era Limited Release range from the Frankland River in the State's famed Great Southern region, including a rewarding 2011 Malbec. Senior Winemaker, Kim Horton says the range epitomises the best from Frankland River, that's one of the coolest wine-producing areas in WA. And the 2011 Malbec is one, he says, the whole Ferngrove team is particularly excited about, as while displaying robust tannins and dark plum and spice on the palate, it's interestingly restrained rather than a smack-in-the-mouth flavour hit. Pay $20 and match this buy-now, drink-now drop with pork and fennel sausages served with potato mash infused with a good handful of Italian parsley. DISCOVER the pleasures of this Fiano, a little-known drop here that's sure to prove as popular as in its homeland Italy. NICELY flavoursome, yet restrained rather than a smack-in-the-mouth.